The Council on American-Islamic Relations (CAIR) successfully presents itself to the media as a benign civil rights organization, comparable to the NAACP or the ADL, a description that conservatives ineffectively rail against. In this light, perhaps a tweet sent out just after midnight EST on Nov. 9 by Hussam Ayloush, long-time head of CAIR's Los Angeles office, will help awaken the press to CAIR's true Islamist identity. Email from Hussam Ayloush referring to "Zionazis." 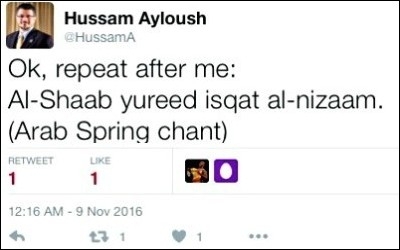 (1) Ayloush may be the most vicious of the CAIR leaders. So far as I know, for example, he's the only one of them to bandy about the term "Zionazi," as evidenced in his e-mail below, dated March 18, 2002. 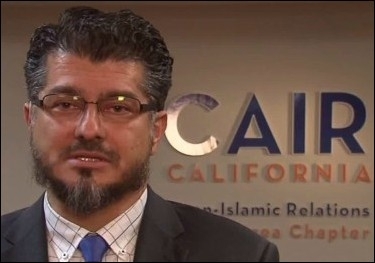 CAIR-Los Angeles head Hussam Ayloush. (3) The dawning of Donald Trump's victory was apparently a trying moment for Ayloush, so he let loose with an emotion he'd normally have kept under wraps. In other words, he offered a rare, candid insight into the mind of one CAIR apparatchik. So, journalists, editors, and producers: do please note what CAIR stands for.